These whimsical dancing bunnies are applied to the canvas with an airbrush, using stencils, in two separate steps. 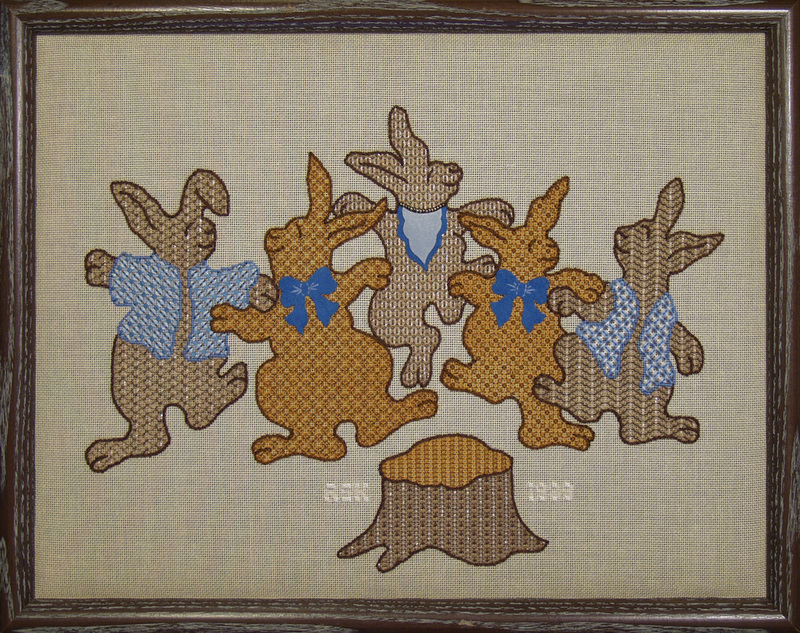 Three of the bunnies are a cool gray brown, and two are a warm gold brown. The stump in the foreground is drawn the same way, using the same two browns. These silhouettes are then embellished with "unconventional" blackwork patterns. These original treatments are also linear outline patterns, but unlike traditional blackwork, many are composite patterns that combine 2 or more sequences to form a more sophisticated network. Several shades of one color and/or thread textures are used together in each pattern, and four of the patterns have a metallic foundation done in trame' so the blackwork actually couches the laid threads. Once completed, the bunnies are then outlined in stem to define their graceful curves better. Each bunny is also dressed in festive attire to suit the occasion. Three have decorative bows or kerchiefs, and the other two have a fancy jacket or vest - both are done in couching patterns that resemble elegant woven ribbon fabrics. Students may choose between a denim blue or a teal for this accent. This class will stress the fundamentals of the double running method of executing blackwork, and we will also explore ways to eliminate the glitches inherent in it so that outlines will be clean and clear. COLOR CHOICE: None for the bunnies themselves but the jackets and other accents can be either blue (as shown) or aqua. 2. To show students ways to keep reversible blackwork patterns uniform by manipulating the thread and planting the needle strategically on the return trip. On canvas the fine thread shifts more readily in the holes, and Ann will teach various methods to avoid this and keep the patterns uniform throughout. 3. To share other refinements in doing double running technique. 4. To explore decorative uses of couching patterns to simulate quilted garments. 5. To introduce students to ways to partially paint a canvas to get isolated accents. canvas, detailed instruction booklet, photograph of the model and all materials needed (e.g. cotton floss, pearl cotton, two Kreinik metallics, 1/l6" double face satin ribbon, ultrasuede and colored kid). The design is also available in two color options - the denim, as shown, or a teal accent for the jacket, vest, kerchief and bows. STUDENT PROVIDES: 2 HiLiter pens, a laying tool, embroidery scissors, clamp or weight to secure frame to the working table, lamp and/or magnifier, if needed, along with an extension cord. Cuticle scissors are also suggested for cutting ultra suede appliqués. Minimal extra cost anticipated.